"Here's an old-time hamburger and mixed vegetable soup, made the way Grandma made it...if Grandma had a slow cooker. If you can't go home and check on it on a week day be sure to added extra broth at the beginning. A large bag of frozen mixed vegetables can be used in place of the canned vegetables." Stir beef broth, ground sirloin, corn, green beans, peas, tomato sauce, carrots, potatoes, onion, celery, garlic, parsley, celery seed, and bay leaves together in a slow cooker. Cook on Low for 4 hours. Check for moisture and add broth as needed. Continue cooking another 4 hours. Season with salt and black pepper. Made this for my hunters. They loved it. Made no changes. They even begged for more!!!! No changes except my hubby put jalapenos in his. It was great! 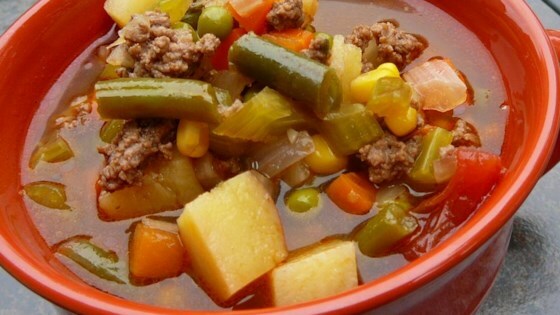 We really like this Hobo ground beef and vegetable soup. I added cabbage cut in small pieces.